So we’ve got yet another blog touting the future of the SpatiaLite format as being the next Shapefile. Now don’t you dare look over at that search feature on the right side of my blog and type in SpatiaLite because you’ll probably see the same thing (though honestly I can’t recall if I was of sound mind when writing it). The simple fact is SpatiaLite is a favorite format for those of us with nothing better to do than tell the rest of the world what they should be looking at. 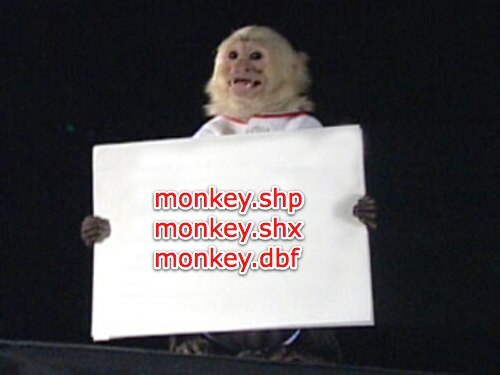 GeoMonkey loves the shapefile because it just works. Ah! But like most things, just because a bunch of bloggers think it is a good idea doesn’t mean it will actually matter. In this case SpatiaLite is dying a slow death because no one is actually implementing it. Now yes OGR, FDO and other libraries support it, but you don’t see that making its way into mainline software (QGIS aside, but even its support is poor) and in turn you rarely see it in the real world. Offhand I can only think of the “beta” format that GeoCommons has on their service (and they’ve had beta attached to it for almost a year). Now yes, I think we all need a better format than the venerable shapefile (and it’s three amigos) which as a transmission format fails miserably. But there doesn’t seem to be any indication that this is a problem people actually want solved. I’ve seen much more effort put into KML, GeoJSON and LAS by the community than SpatiaLite or even SQLite. This isn’t because the SpatiaLite project hasn’t given tools to us to implement, it has been the community could care less about it. SHP works for them and there isn’t any reason to change. Oh and the FGDB API - just assume it is dead as well. ESRI can’t get it out the door and in reality, no one give a hoot other than federal agencies that have to provide open data, but are locked into to the ESRI stack.